current role while protecting his younger sister Nikki on the ice. 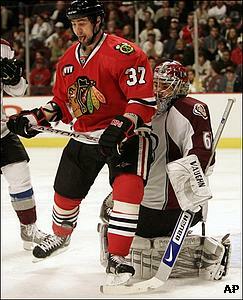 Adam Burish has never met a challenge he didn't like. A wide smile parades across his face, and without hesitation or care that his Chicago Blackhawks' teammates are within ear shot, he burst into song, "Iffff you want to be a Badger, just come along with me…" His voice trickles off and his smile fades when he realizes he's all but forgotten the rest of the words. His rendition of one of many Wisconsin Badgers school songs may have been short lived, but like his approach to anything involving hockey, Burish didn't back down when asked to sing in the middle of a half-crowded team dressing room. The 25-year-old University of Wisconsin graduate bleeds red and white, you see, and his love for his hometown and alma mater have made him who he is today. He's become the team's agitating, in-your-face pest who has a knack for blocking shots. He has been an integral part on the penalty kill (19th in the League at 82 percent), and moreover, has emerged as a young leader -- all in his first season as a full-timer on the resurgent Chicago Blackhawks. "I love that confrontation -- getting in someone's face and kind of being a pest out there; to see how they're going to react, what they're going to do," he said. "That's what's allowed me to play at this level. You have to have a niche, have to do something special and something different, and for me that's getting in people's faces, fighting, and blocking shots -- doing the dirty stuff. I get a lift out there if somebody pushes me and I push him back, or if somebody pushes (Jonathan) Toews and I get to go after him a little bit. That excites me." Burish, whose father, Mark, is a business and commercial attorney, and mom, Helen, who is an art teacher, grew up in suburban Madison in Wisconsin. But despite living in the middle of Badger country, his family had no ties in hockey whatsoever. Burish's hockey career began on a whim thanks to his mom's friend, whose son started playing pee-wee hockey at 3. "I've been playing ever since," he said with a smile. "And that's how my sister got started because she'd come out there and follow me around." Times have changed. With 188 penalty minutes in 69 games, Burish (1-4-5) is anything but the cute, shy boy who pushed chairs around while learning how to keep his balance in his oversized jersey and hockey pants. Today, he's most likely pushing opponents around while attempting to make a turtle of the guy who just took a shot at the Blackhawks' biggest offensive threats, Toews (19-26-45), Patrick Kane (16-43-59), and leading goal scorer Patrick Sharp (34-19-53).This season, he's battled the likes of Colorado's Ian Laperriere, Anaheim's Joe DiPenta, and most recently, Dallas captain Brenden Morrow. But his protector role isn't anything new. It began when playing on the same youth hockey team with little sister Nikki. "Growing up, she always played on my team," he says. "She was a year younger than me so every other year we'd play on the same team. I'm still pretty protective, if you ask her. She gets annoyed with me, but when we were playing together I'd always look out for her, and being at college together not much changed. She had an older brother that maybe got in her way a little bit, but I liked it that way." 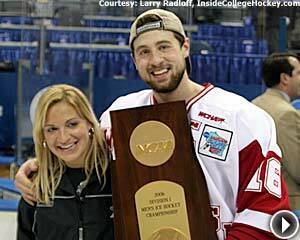 Burish plays the big brother role to a T, so when Nikki briefly turned the tables by winning the NCAA Women's League Championship in 2006 with the Badgers, she let her brother have it. It was time to put up, shut up, or forever hold his peace. Burish, the team's second-year captain, went on to win the NCAA men's title a week later as Wisconsin bested Boston College 2-1, fittingly at the Bradley Center in Milwaukee. It was a special time for both collegiate hockey stars. "It was pretty neat because their tournament was a week earlier and we had just gotten done playing and getting into the Final Four," he recalls. "I was in the locker room celebrating and I grabbed my cell phone while I still had my gear on and called her and found out they had just won. I was probably more excited for her than she even was." Winning the NCAA title was the icing on the frozen cake, but Burish doesn't need photos to reminisce about his college glory days. All he has to do is look around the Blackhawks' locker room. Rene Bourque, in his third season with Chicago, Jack Skille (of Madison) and Jacob Dowell (of Eau Claire, Wisc.) are also former Badgers. "Obviously when they're all here we take a lot of pride playing for Wisconsin and now being in the NHL, it's pretty neat," Burish said. "We look out for each other and we'll go for dinners together when we're on the road. We have a little brotherhood here now and some of the guys give us a little bit of grief telling us to cut the cord -- and give it up -- and enough with the Badger stuff," he said. "But you know, it's special for us being together for three or four years and then being able to play in the NHL together, is pretty cool." the 2002 Draft, and reached the NHL last season. Wisconsin hockey has produced some of the most notable of active hockey stars, like veteran Stanley Cup-winning defenseman Chris Chelios, still on the blue line with the Detroit Red Wings, and Senators All-Star Dany Heatley. Chicago's lowest draft pick -- in the ninth round and 282nd overall in the 2002 Entry Draft -- Burish is proving that despite the numbers, he's worthy of wearing the jersey. He may have to work harder for it, but his hunger to stay put can fuel even the biggest of engines. As a fourth-line checker, Burish's job isn't to score, but that doesn't mean he doesn't want to light the lamp. But it was his leadership on the ice and physical play that was the motivating factor that earned Burish the 'A' on his sweater as an alternate captain Jan. 1, even before scoring his first NHL goal on Jan. 22 against Evgeni Nabokov and the San Jose Sharks. Just a couple of years since wearing the "C" for Wisconsin, those leadership traits are on display for Blackhawks coach Denis Savard. "That kid plays with a lot of heart," coach Savard says. "He battles out there and gives us the energy we need at important times. He's been good on the penalty kill with Craig (Adams), and he isn't afraid of using his body to block shots. He has really earned every shift." And though 25 is considered young, Burish is still six years older than superstar rookie forwards Kane and Toews, who may need direction on and off the ice. Burish doesn't believe leadership has an age requirement. "Age can mask the fact that you're a leader, but to me, I can be a leader in my own way," says Burish, who became the Badgers' captain in his junior year. "I don't have to be 30-years-old and be in the League for 10 years to be a leader. That's the way I've kind of looked at it and have tried to handle my business here." On his off days, Burish says he's a little too banged up to go out too much, other than to test his palate at Chicago's best restaurants, using his newly purchased restaurant guide. He also relaxes by playing his acoustic guitar by strumming some Dave Matthews, GooGoo Dolls, and Collective Soul, a talent he picked up in his freshman year of college. "I love Chicago," Burish says. "It's an amazing city and it's exciting with the team we have right now and the near future. It's a good feeling to be a part of that." It looks like this Badger has found a new home.